One of the most beautiful early 20th century maps of San Francisco. The 'Chevalier' Commercial Pictorial and Tourist Map of San Francisco. 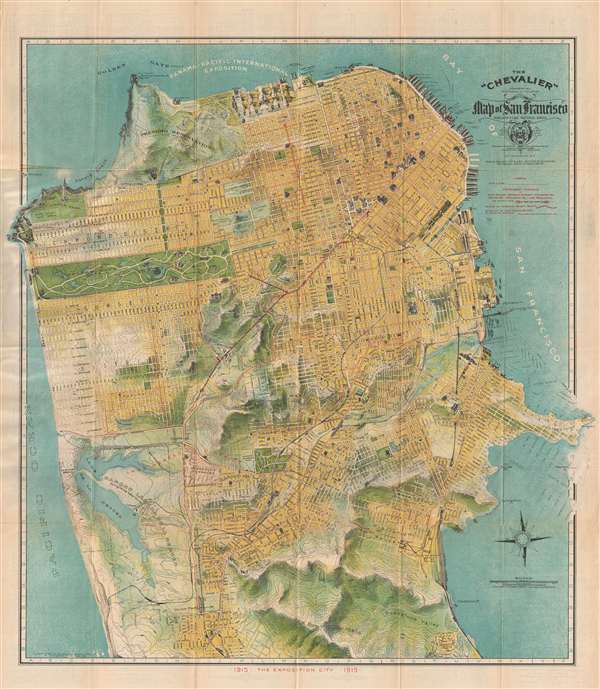 One of the most beautiful early 20th century maps of San Francisco. This remarkable 1915 chromolithographic topographical and pictorial map of San Francisco, California was issued by August Chevalier. Named 'The Chevalier' after its author, the map covers the city of San Francisco from the Golden Gate to Colma and from the Pacific Ocean to San Francisco Bay. The eastern most portion of the map, Hunter's Point, breaks through the border to nearly touch the paper's edge. The city's grid structure is overlaid on a topographical map much as the real-life San Francesco street grid is overlaid on the peninsula's impressively hilly terrain, producing the city's unique topography of steel streets and sharp sudden inclines. Important buildings are shown in profile. Overprinting in red identifies proposed tunnels and trolley lines. Proposed improvements and landfills are ghosted in a t the eastern side of the city surrounding Hunter's Point. This map was copyrighted in 1912 but issued in anticipation of the 1915 Panama- Pacific International Exposition. The original map upon which it was based was a larger format wall map, also called the 'Chevalier,' published in 1903. The map was subsequently reduced to the present form and reissued in several editions, this being one of the more significant for its association with the Exposition. The map folds into its original paper binder with an art nouveau stamped cover. August Chevalier (fl. c. 1903 – 1932) was a San Francisco based lithographer active in the first decades of the 20th century. Chevalier is a remarkably elusive figure and little is known of his personal or professional life. He is best known for his large and magnificent topographical map of San Francisco boldly known as 'The Chevalier.' His few other maps also, almost exclusively, focus on San Francisco and the surrounding communities. Very good. Minor verso reinforcement at some fold intersections. Folds into original binder. Stored flat. Rumsey 5865.002. OCLC 28943362, 953568824.